Barb Slone | Greene County News John Bloom and his family recently celebrated his 100th birthday. One of the cakes featured an edible photo of Bloom. 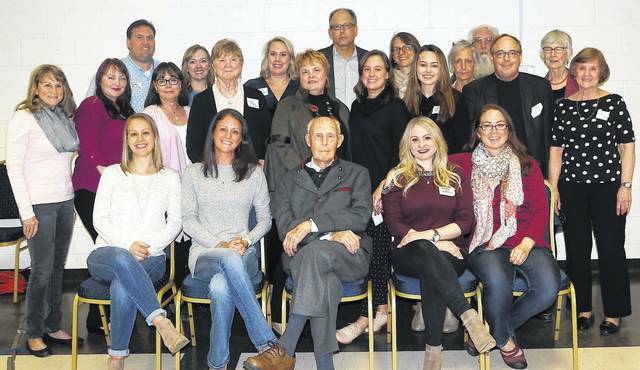 XENIA — John C. Bloom celebrated his 100th birthday with family and friends from all over the country March 30. They came from the U.S. Virgin Islands, Oregon, Washington and even Vermont, where Bloom’s brother, Barney, lives — among other places. 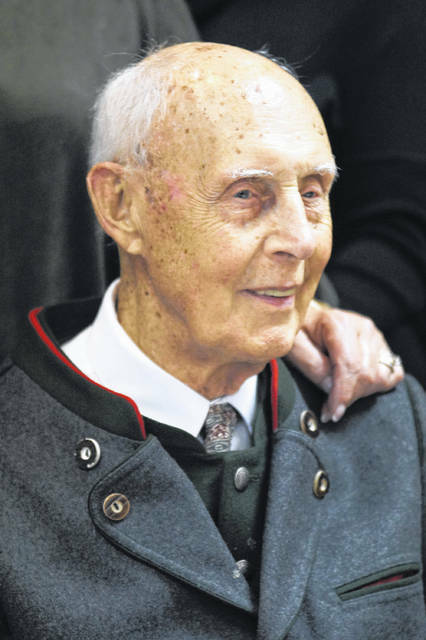 Bloom was born in Greene County March 5, 1919 and has spent the majority of his life in Xenia. After graduating from Xenia High School he attended The Ohio State University where he was a sousaphone playing member of the marching band as well as other bands. He was a participant in early Script Ohio performances although he never “dotted the I.” After graduation he became an officer in the United States Army and provided support to bombers in England during World War II. Following the war and a brief stint with Pan American World Airways as a flight steward, Bloom joined Goodyear Tire and Rubber as a sales representative in Central Africa. It was there two of his children, Bill and Maggi, were born to Bloom and his first wife, Marjorie. Bloom’s other children are Suzy Bloom, Sue Randall, and Karen Bloom. When he returned to Greene County, Bloom tried farming and finished his working career working at the Defense Electronic Supply operation in Kettering. Several years after Marjorie’s death, he married Jeanette Starr, mother of Karen, Suzy, and Sue. John and Jeanette did much world travel before settling in Xenia. Still driving and active in Memorial’s choir and adult Sunday school, golf, bridge, and volunteer activities, Bloom now lives alone in Xenia. At the celebration, held at Memorial United Presbyterian Church, he received proclamations from Gov. Mike DeWine, Xenia Mayor Sarah Mays, and Cong. Mike Turner. MC for the celebration was Kevin Murphy, pastor of the church. Bloom said he expects to be around to celebrate his 105th birthday. 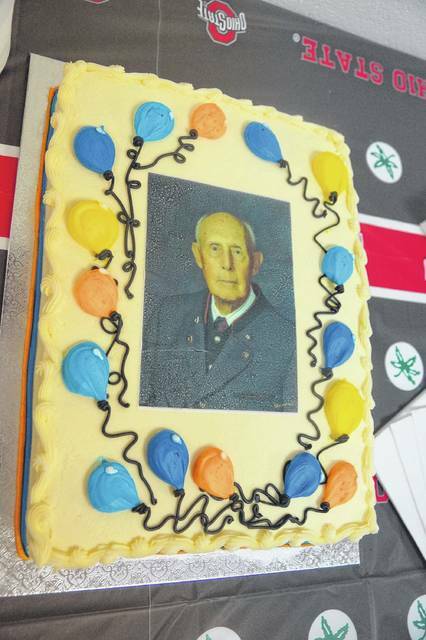 https://www.fairborndailyherald.com/wp-content/uploads/sites/50/2019/04/web1_DSC08909.jpgBarb Slone | Greene County News John Bloom and his family recently celebrated his 100th birthday. https://www.fairborndailyherald.com/wp-content/uploads/sites/50/2019/04/web1_DSC08905.jpgOne of the cakes featured an edible photo of Bloom.